Tackling the remake of an iconic Australian film is a brave undertaking. Sure the name recognition is there, but so to is the idealised image of the original to be held in opposition to your work. Director Shawn Seet tackles this by presenting an updated tale, telling the classic Colin Thiele’s novella in the form of a flashback. However, is that enough for this version to take flight? As retired CEO Mike Kingley (Geoffrey Rush) arrives back in Australia for business, he attempts to reconnect to his granddaughter, by recounting the story of his own childhood. 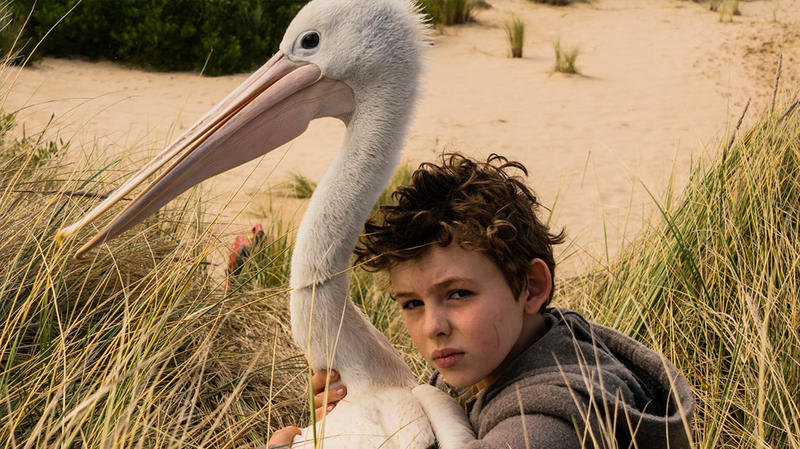 His tale is that of a young child (Finn Little) struggling to repair the relationship with his isolated father (Jai Courtney) after they both suffer a tragedy, and how a trio of orphaned pelicans help him to overcome this. The chief fault of this remake lies in the framing device. Although it brings the tale into the modern day, it takes a while for the main narrative arc to actually begin. Even when it does so, the constantly switching back and forth to this device, often robs the tale of momentum, rather than acting as a pause to refresh that the device is obviously intended to do. Packing both storylines into the run time of the film, means that the simple arc of Storm Boy seems to be even more trimmed, and loses some of the nuance of the ’76 version. Finally, there is a serious disconnect, between the life lesson learned through these events, and the character Mike Kingley has become with age. Sure, part of Mike’s purpose is to re-invent himself through the course of the narrative in the eyes of his granddaughter, but to believe that he has acquired a mining company in the later half of the 20th century that is big enough to be mining half the Pilbara, purely while respecting indigenous beliefs about land care (as taught to him by Trevor Jamieson’s Fingerbone Bill) is a bit of a stretch. Even if that was the case, his actions in regards to his son-in-law run contrary to his message of family reconciliation and respect, that form the arc between Hideaway Tom and Mike. Even with these faults Storm Boy holds moments of pure magic. A number of these are down to the power of the cinematography, especially when Mike is reconnecting with his younger self, and the walls between past and present become fluid. It showcases the wondrous location, allowing the natural setting of Coorong to shine. The other strength here is Courtney and Finn Little. There is a genuine warmth in their relationship, and Courtney seems incapable of even looking at Little without demonstrating paternal warmth and protection. It adds a layer of believability to the performances, and gives both actors a firm basis to explore their emotional range as the characters go through a number of meaningful events. All this leaves Storm Boy as a beautifully shot, and somewhat patchy retelling of this iconic Australian tale. However it’s still recommended that you bring tissues to a showing, as the final act still packs the punch of Thiele’s original story, and will leave kids and adults weeping.